Ladies….if you are looking for a fantastic gift idea for a special man in your life then I would like to recommend Lucky Tiger Grooming products for men. My husband is very particular about fragrances and if a product has even a slightly overpowering scent he won’t even try it. That makes finding the perfect grooming products quite difficult. I hit the grooming jackpot when I discovered Lucky Tiger Liquid Shave Cream and After Shave & Face Tonic. Lucky Tiger is made with only the finest natural botanicals including certified organic Chamomile, certified organic Olive Fruit Oil, certified organic Calendula and borage oil to provide the ultimate shaving experience for any man. I tentatively handed my husband the Lucky Tiger Liquid Shave Cream to try and he gave me “the look”. He finally agreed to try it just once and soon proceeded to tell me that he loved it and thought it smelled great. In all honesty that is the first time in eight years that he liked a grooming product that I gave him. Lucky Tiger Liquid Shave Cream is unique in that it applies smoothly like a lotion but turns into a rich cream. The fresh and clean scent is amazing and got the highest approval rating from my husband. It is subtle yet manly and he smelled so nice and his skin was smoother and softer than ever with no razor burn. Lucky Tiger After Shave & Face Tonic is a modern take on traditional after shave and I love that it uses organic ingredients and is alcohol free. There is no need to worry about overpowering scents with Lucky Tiger because the After Shave & Face Tonic smells just like a burst of fresh citrus with notes of orange, grapefruit and tangerine. The scent dissipates so that the man can use his favorite cologne and the scents won’t compete. 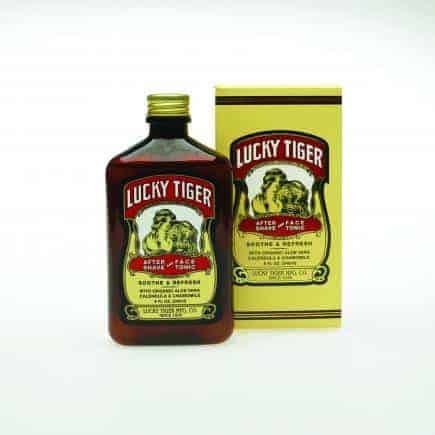 Lucky Tiger After Shave & Face tonic provides skin with excellent soothing, toning and invigorating freshness for the ultimate shaving experience. Since 1935 Lucky Tiger has been producing the highest quality grooming products for men. Lucky Tiger would make an excellent gift idea for the holidays and is sure to be a hit with all the men in your life including grandfathers, dads, brothers and of course that special man! I read your testamonial about Lucky Tiger cream. My children got me some through Birchbox but I ran out. I live in Orlando as well, and thought I would inquire with you about where to obtain replacement her in Central Florida. If you know as to where, I would greatly appreciate it!